What processor: probably which i7? Most importantly, (this is the bit I always struggle with) can you recommend a specific motherboard? I'm no expert so I'm not going to advise you generally. However, remember where we came from and where we are now. 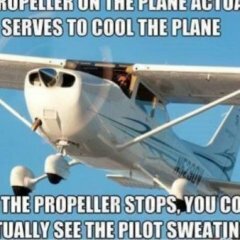 One of the problems with FSX and its predecessors was that it was heavily CPU dependent and didn't make best use of the newer generations of GPU's. Although P3D has moved forward (particularly in being a 64 bit system), that basic architecture hasn't been fully addressed yet. At some point, it's expected that P3D will shift burden from CPU to GPU. So if you are on a budget I expect you can get something that will run P3D adequately now but think about your upgrade path, which is likely to mean a new GPU in a year or two's time. In some ways that's the easy route because anyone can install a graphics card while I know my weaknesses and wouldn't touch my CPU. Make sure though that you have an easy upgrade path: obviously the right form-factor but also the right power unit. The newest cards (e..g. 2080 for example) require a bigger GPU than a 1080 or 1070. ,It'll cost next to nothing (compared to the rest of it) to get it now and will save pfaffing around when you want to upgrade. Thanks. I'll take that into account. So as well as a good CPU, buy a good GPU now to save the hassle later when P3D becomes more GPU dependent. A good strong budget build would be a 9600K with a 2070 or 2080. 16gb RAM is enough but I would go for 32gb especially if you plan to use XP11 in the future. Thanks for the specific answer. However, was 9600K a mistype? Do you mean i7-9700K or i5-9600K? Thanks. Then name this budget, please. I claim that with whatever budget you have, it is possible to give you a list of hardware resulting in a config you can use P3D with. But without defined, precise budget, the list of compontents will be random, some might put more weight on a good CPU, others on RAM, others on the GPU. II would not consider a graphics card that costs £700+ as part of a budget build! Ok. Let me rephrase my question for all you "define budget" people. It doesn't have to be a £600 PC, but equally something that won't break the bank. Actually, scrap that. I would just like to know about the processors/graphics cards/ram/motherboards/etc/etc that you guys would recommend. Thanks. In my case I just want to be able to use ORBX FTX Global a few specific airports here & there, my PMDGs... That's pretty much all I use P3D for. It never gives me less than 30 fps in my 7 yo i5 2500 @ 3,2 GHz, 16 GB DDR3 RAM and GTX 960 4GB GDDR5 gpu. Now that, ladies and gentlemen, is what I call a budget build. Also, I am unconvinced by RTX 2070 and 2080... what does it add that is worth an extra £300? I really have to bite my tongue here. But why is it a few select people on these forums feel the need to constantly attack others opinions? If you don't have anything constructive to add don't bother posting at all. I'm seeing this way to often lately. So go ahead and offer your advice if your so smart. I cant wait so I can openly bash your opinion. I am not sure how my comment can be considered to be an "attack"
Yeah so whatever your budget is now, get the power unit for a top spec GPU, pay for the best CPU you can afford and balance it by perhaps getting a lower spec GPU. That way you'll run P3D adequately now with a strong CPU but a adequate but not brilliant GPU. Later on, as an when P3D shifts the burden, get a top spec GPU and you'll have what is still hopefully a good CPU and a good GPU as well. I'd say it's simple: as much as you can afford (= as much as you WANT to afford), with balanced components - e.g. not a CPU for $300 and a GPU for $2000. I don't think anyone can give you an educated recommendation, since I can't read you writing how much you are ready to pay per CPU and GPU and rest of components (don't forget, it's not only CPU and GPU, but the whole build. Otherwise I might just write i9 and rtx 2080 ti. And the word "budget"... for some is a $200 CPU budget, because $700 is too much, and for someone who could afford an extreme CPU for $2000, $700 is budget. Get my point? Same goes for the GPU. No matter which GPU you take, the more expensive cards will have more processing power meaning you'll be able to turn more sliders up. As simple as that. Want no jaggies? Need at least 4x SSAA. Want more and further shadows, high quality water... blah blah. Need more GPU power. And, it is my opinion that setting some standards (like the post from jcomm, no insult intended) is somewhat pointless. As each simmer configures their system differently - and there are many settings that impact performance in different ways. And as some pointers may guide you in some direction, someone saying "I run 40fps with x-configuration" is nearly meaningless for you specifically. Because you will most surely not set up the system 100% the same way jcomm does. Mine is still real nice for flying GA planes. IDK about big study-level airliners cuz I dont have those. OK. Please can we now forget the word budget. I need a system which can run P3D with the PMDG 737, some orbx products, and also so it looks good.